Feisal has 20 years of experience in marketing, communications, research, economics, and social and business development. He began his career working for Dutch market research, advertising, media and consulting agencies. Leading brands that he managed included Vodafone, Texaco, Mitsubishi, Nestlé, Unilever, and Ericsson. 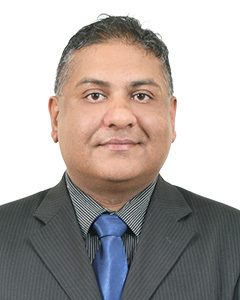 As senior market research analyst at Dutchtone, Feisal was part of the Orange World Wide Market Research Team. In 2006 he embarked on a wide-ranging international career as a management consultant and FDI expert based in the Republic of Suriname. International Organization Migration: set-up and executed need-based research in Suriname within the public, private and civil sectors). Hi Jet Aviation NV: business development, marketing strategy and project management. Aviation and medical services: Suriname-Guyana-Aruba-St. Maarten-Panama-Morocco. Trade Centre NV: Chief Strategy Officer. Ministry of Trade and Industries: need-based evaluation research: investment promotion and facilitation. Government of Suriname and the Netherlands: waterfront and port rehabilitation in Suriname (PESP 04050). Design and execution of investment preparation study of city development, cruise tourism. Investment Development Corporation Suriname: Chief Investment Officer, Non-Resource Based Industries. Established and set-up Suriname’s Investment Development Agency. Pro-Invest/CAIPA/UNCTAD/CEDA/EU/CRD-RD, Strategic Investment Promotion for the Caribbean Association of Investment Promotion Agencies. CAIPA/Training: Advanced Marketing and Investor Aftercare (Customer Relation Management). KOTRA (Korea Trade-Investment Promotion Agency), Investment Promotion and development of economic/industrial zones. Education: MSc Communications, Marketing communications (Catholic University Nijmegen). Languages: Dutch (native), English (very good), German (good), French (fair), Spanish (fair).